None So Vile is an unyielding auditory terror created by Canadian death metal masters Cryptopsy. The album features troglodyte impressionist Dan Greening (better known by his stage name Lord Worm) whose polarising vocal performance consists of grunts, growls and howls that make the lyrics entirely undecipherable. His performance will leave the eyebrows of the uninitiated permanently raised. The most memorable performance on None So Vile is provided by drummer Flo Mounier, who hammers away relentlessly at an inhuman speed with unnerving endurance. His playing often takes centre stage but guitarist Jon Levasseur steps into the spotlight to take the lead role occasionally and plays some short but infrequent solos between it all. Bassist Eric Langlois is hardly heard through Cryptopsy’s 32 minute cacophony. He does manage to make some distinct appearances during the bridges of some songs and can be heard clearly on parts of Slit Your Guts and Benedictine Convulsions. Cryptopsy manages to soften up for the better part of 35 seconds to play a calm solo piano piece on Phobophile. It gives your ears just enough time to recover before the band gives in to temptation and resume their aural bombardment duties. 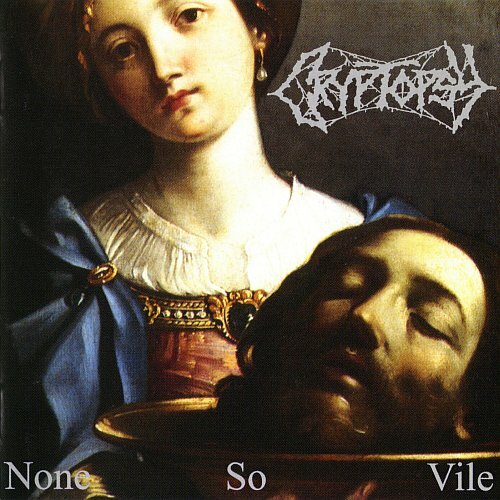 While there aren’t any lacklustre songs on None So Vile, Cryptopsy doesn’t change their sound much from song to song. Instead the band relies on their technical abilities to make the songs distinct from one another. None So Vile lives up to its name and delivers on all accounts. It will be loved or hated by the listener without much room for a grey area but as far as death metal goes, it has certainly become a staple of the subgenre.